State and Autonomous Communities institutional representatives, together with experts from different disciplines discuss the role of Maritime Spatial Planning and Integrated Coastal Management as tools for tourism sustainability governance. They highlight the importance of integrating coastal-maritime planning and introducing ecosystem carrying capacity to manage recreational uses of the sea and maritime tourism transport. Barcelona, 16th November 2018 – The third edition of the Blue eco forum was held with the objectives of reflecting, debating and showing good practices for the integration of the ecosystem approach in the maritime spatial planning of tourism in the Levantino-Balear region. During two sessions, different visions were debated on the necessary integration between coast and sea for the governance of tourism and the difficulty that this integration poses today in one of the European areas with the greatest influx of visitors. The forum was once again held at the Museu Marítim de Barcelona. 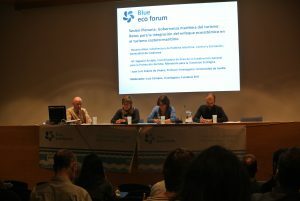 The activity was organised by the eco-union association with the support of the Biodiversity Foundation, the Ministry for the Ecological Transition and Barcelona City Council and was supported by the ENT Fundació, which helped to moderate the first session. The forum was divided between a plenary session and a technical session. The first session, entitled: Maritime Governance of Tourism: Challenges for the Integration of the Ecosystem Approach in Coastal-Maritime Tourism, focused on the governance of tourism on the Spanish coastline. The session unfolded with presentations and a subsequent dialogue between the Ministry for Ecological Transition and the Generalitat of Catalonia, where strategies and regulatory frameworks in force at Spanish and Catalan levels were presented, as well as plans for adapting regulations to a growing tourism sector. They were accompanied by Juan Luis Suárez Vivero, researcher at the Universidad de Sevilla and Luís Campos, from the ENT Fundació, who moderated the debate. The second session, of a more technical nature, served to showcase good practices, projects and examples of intersectorial regulation focused on the conservation of coastal and marine ecosystems based on more sustainable coastal-maritime tourism. In this session, eco-union members Miquela Grimalt and Alejandro González presented the PLANMEDTUR project, an investigation that generates recommendations for the integration of the ecosystem approach in the maritime spatial planning of tourism in the Levantino-Balearic demarcation. Miquel Mir Gual, Director General of Marine Spaces and Biodiversity of the Balearic Islands, presented the Decree for the protection of Posidonia in the Balearic Islands, a pioneering document that rewrites the way to make conservationist environmental policies effectively and limit the impacts of recreational boating. 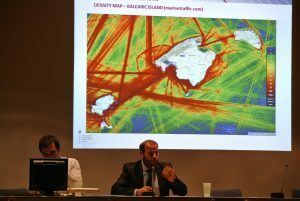 Niccolò Bassan, researcher at the Università di Venezia, carried out an analysis of projects linked to coastal-maritime planning such as ADRIPLAN, developed in the Adriatic-Ionian basin, one of the most touristic areas of the Mediterranean Sea. Josep Rodríguez, from DIBA, showed Interreg projects related to sustainable tourism and maritime space and gave recommendations for the sustainable and integrated management of the sector. Finally Jeremy Sampson spoke to show the work done by IUCN in the development of a methodology that promotes cooperation between the public and private sectors for the development of ecotourism in protected areas. The Blue eco forum 18 concluded by contributing to a reflection on how to improve the integration of the ecosystem approach in Maritime Spatial Planning, and to the coastal-sea integration for a better governance of tourism in the Levante-Balearic coast. eco-union, created in 2005, is a non profit association that works to create and connect agents of change among the different sectors of society, public administration, economic and social actors to catalyze the transition towards sustainability. © 2019 Global Eco Forum.